Several days ago, I wrote a quick post highlighting an article from The Atlantic titled The Problem with History Classes. In it, author Michael Conway suggests that traditional social studies instruction which focuses on the “right” answers doesn’t allow for enough academic discomfort. Social studies teachers need to go beyond basic foundational knowledge and create a sense of ambiguity and uncertainty in how things are going to work out. One suggestion from Conway? If our students really are going to learn and master historical thinking skills, it is “absolutely essential that they read a diverse set of historians” and learn how a variety of historians who are scrutinizing the same topic can reach different conclusions. But what can that look like? 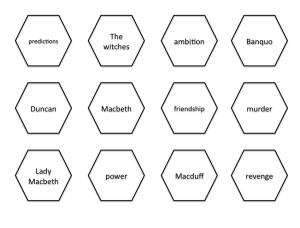 You may want to try an activity using hexagons – it’s an activity that can help your students grapple with historical viewpoints and start to understand connections between them. 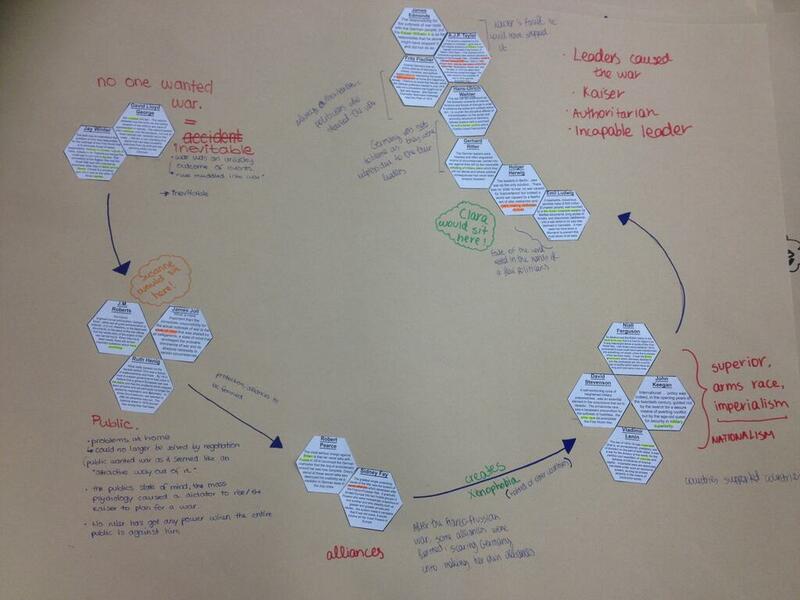 The concept has been around for a while with lots of teachers using hexagons as part of a larger idea called SOLO. The basic idea is that students are given a set of laminated hexagons and asked to write key words or phrases from a specific topic on them using dry erase markers. 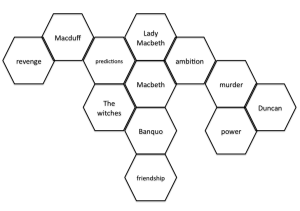 You can also create hexagons with words or phrases already on them. Students then link together related hexagons and be prepared to explain why they arranged the hexagons the way they did. You might also try using different colors for different things – perhaps red for people, green for ideas, and yellow for events. A short YouTube video highlights this variation. Your brain should already be thinking about what this might look like in history and social studies. Use people, ideas, vocabulary, events, or as we’ve been talking about already, conflicting views about the same event. Here are 18 historians with different viewpoints about the Origins of World War One. Your job is to cut up these cards, read each one carefully, and arrange a dinner party reception designed to ensure that nobody ends up sitting adjacent to anybody that they will argue with too much, but will instead sit adjacent next to somebody or several people that they broadly agree with! Work alone at first, then compare your ideas with a partner and with the class. Stick down your cards when you are happy with your seating plan, and provide a key to explain why each ‘table’ has been arranged in that particular way”. Discussion points: (a) Where would you seat yourself, and why? (b) If a fight was to break out between two tables of people – or two key individuals – which would they be, and why? He also has a great example on the rise of Stalin. Even better, Tarr has created a quick and easy way for you to generate your hexagons. Simply type or paste your words or phrases into the text box and, presto. Hexagons. Need even more social studies examples? Go here to get a wide variety of examples including Prosperity and Prohibition and Causes of the Cuban Missile Crisis. But since this is the 150th anniversary of Appomattox and the end of the Civil War, why not try the hexagon idea with information from that period? I’ve listed a few resources below that you might find useful. When the North emerged victorious on April 9, 1865, the U.S. entered a new era. However, the war’s legacy of destruction would leave deep scars. 150 years after Lee surrendered at Appomattox, Americans are still fighting over the great issues at the heart of the conflict. Did Northern Aggression Cause the Civil War? The war was all about slavery. Reblogged this on 14Edges' Blog. Loved your previous post on the Problem with History Class and this one. The main problem I have found with the historiography approach is logistical. Finding a variety of historian interpretations on historical topics is challenging. There are a few lessons out there with them already, but many of the ones I have used come from my own reading. The idea is great but gathering and preparing the resources necessary to accomplish it is time consuming. You’re right. Finding resources is often one of the most time consuming parts of teaching. Russell Tarr’s 18 different viewpoints is a bit overwhelming. I would definitely start with a smaller number or even use the hexagon idea with other documents, foundational knowledge like people and ideas, or even try with geographic places.